Glia are important modulators of neural activity, yet few studies link glia to sleep regulation. We find that blocking activity of the endocytosis protein, dynamin, in adult Drosophila glia increases sleep and enhances sleep need, manifest as resistance to sleep deprivation. Surface glia comprising the fly equivalent of the blood-brain barrier (BBB) mediate the effect of dynamin on sleep. Blocking dynamin in the surface glia causes ultrastructural changes, albeit without compromising the integrity of the barrier. Supporting a role for endocytic trafficking in sleep, a screen of Rab GTPases identifies sleep-modulating effects of the recycling endosome Rab11 in surface glia. We also find that endocytosis is increased in BBB glia during sleep and reflects sleep need. We propose that endocytic trafficking through the BBB represents a function of sleep. Sleep is a conserved behavioral state of fundamental significance. Nevertheless, the nature of its relevance to brain function is still a matter of active research and debate (Krueger et al., 2016). Most studies of sleep function focus on consequences of sleep loss for performance, in particular cognitive ability, or for overall physiology. Little is known about the impact of sleep on basic cell physiology or the extent to which cellular perturbations affect sleep. Amid the existing hypotheses for the purpose of sleep, multiple avenues exist for glial contribution to both regulation and function (Frank, 2018), which have been minimally explored. Glial function has been linked to sleep in some contexts (Bjorness et al., 2016; Chen et al., 2015; Halassa et al., 2009; Farca Luna et al., 2017; Seugnet et al., 2011). Sleep is well-associated with improved learning and memory, and appears to support synaptic remodeling (Krueger et al., 2016; Tononi and Cirelli, 2014), which may be accomplished in part by astrocyte and microglial activation (Bellesi et al., 2017). Clearance of brain interstitial fluid has been shown to require the glymphatic system that involves astrocytes and whose function is enhanced during sleep (Xie et al., 2013). Glial signaling may also contribute to sleep need (Bjorness et al., 2016; Halassa et al., 2009), potentially as a consequence of astrocytic sensing of metabolic or energetic conditions (Clasadonte et al., 2017). In Drosophila (Seugnet et al., 2011) and mice (Halassa et al., 2009), astrocytes reportedly influence sleep amount or quality following sleep deprivation. Disruption of vesicular trafficking in mouse astrocytes by dnSNARE expression prevented homeostatic rebound sleep following deprivation, suggesting that glia release sleep-promoting factors (Halassa et al., 2009). Likewise, Notch signaling acts in fly astrocytes to modulate sleep and learning in response to sleep loss (Seugnet et al., 2011). Endocytic/exocytic trafficking is also important in fly glia for the regulation of circadian behavior (Ng and Jackson, 2015; Ng et al., 2011), but effects on sleep have not been explored. Given the genetic tools and accessibility of defined glial populations in Drosophila (Edwards and Meinertzhagen, 2010), the model is well positioned to discover new aspects of glial influence on sleep. To address the role of glia in homeostatic sleep in Drosophila, specifically rebound sleep following deprivation, we blocked vesicular trafficking during sleep deprivation using Shibirets1 (or Shi1), a temperature-sensitive dominant negative allele of dynamin, a GTPase involved in membrane scission (van der Bliek and Meyerowitz, 1991). Flies expressing Shibirets1 (UAS-Shi1) by a pan-glial driver (Repo-GAL4) were raised at permissive temperature (18°C) until adulthood and subjected to mechanical sleep deprivation while being monitored for sleep/activity levels. Concurrently with the start of mechanical deprivation at lights off (Zeitgeber Time (ZT) 12), Shi1 was induced by raising the temperature to a restrictive 30°C. Mechanical deprivation was applied for 12 hr, concluding at the beginning of the following day (ZT 0), when the temperature was returned to permissive 18°C. While mechanical sleep deprivation is not always total, and acclimation occurs over longer timespans, Repo-GAL4 > UAS-Shi1 flies exhibited a surprisingly large amount of sleep above controls throughout the deprivation period, precluding any analysis of subsequent rebound. Experimental flies slept over 300 min in the course of 12 hr of mechanical deprivation, significantly greater than both parental controls (Figure 1A). This effect was present in both males and females and was confirmed with an additional line containing an independent single Shi1 insertion (UAS-20xShi1) (Figure 1A). Inhibition of endocytosis in glia produces resistance to mechanical sleep deprivation. (A) Resistance to mechanical sleep deprivation, manifest as elevated sleep during stimulation, for Repo-GAL4 > UAS Shi.ts1;UAS-Shi.ts1 female flies (n = 14–16, per genotype) and male (n = 16, per genotype) at both 30°C and 18°C. Dashed box indicates the period of mechanical deprivation, ZT12-24. Red shading indicates 30°C, otherwise the temperature is 18°C. (B) Sleep during deprivation at permissive temperature (18°C) was also present using an additional Shi1 line, in Repo-GAL4 > UAS-20xShi.ts1 females (n = 16, per genotype) and males (n = 16, per genotype). One-way ANOVA with Holm-Sidak post-hoc test, *p<0.05, **p<0.01, ***p<0.001. Error bars represent standard error of the mean (SEM). In principle, Shi1 is an allele for a temperature-sensitive dynamin whose vesicle-forming membrane scission function declines with heightened temperature to act as a dominant negative. However, quite surprisingly, we found that increased sleep evident during mechanical deprivation was not dependent on a shift from permissive to restrictive temperature, as Repo > Shi1 flies deprived at 18°C exhibited greater sleep as compared to controls, commensurate to experimental flies at 30°C (Figure 1B). As discussed later, the temperature benchmarks established for dynamin inactivation may not be appropriate for all cell populations or phenotypes (Kilman et al., 2009). Importantly, the locomotor activity during wake (activity index) of Repo > Shi1 flies at permissive temperature does not significantly differ from that of controls (Figure 2), suggesting that the effect is particular to sleep and not simply locomotor impairment which may otherwise be observed with glial manipulation (Zhang et al., 2017). Additionally, to rule out that Repo > Shi1 flies may be less sensitive to the mechanical deprivation stimulus, we stimulated flies between ZT11 and ZT12, a time when most flies are awake. We found that stimulation of awake flies increased beam crossing, and that the average locomotor activity for experimental flies during this time did not differ significantly from that of controls (Figure 1—figure supplement 1). Therefore, it is unlikely that the increased sleep of Repo > Shi1 flies during mechanical deprivation is a result of diminished sensitivity to the stimulus. Inhibition of endocytosis in glia increases baseline sleep. (A) Daily baseline sleep amount (3 day mean) and sleep/activity characteristics including mean daytime sleep bout number, bout length, and activity index for Repo-GAL4 > UAS Shi.ts1;UAS-Shi.ts1 female flies at 18°C (n = 19–26), and (B) Repo-GAL4 > UAS-20xShi.ts1 females (n = 23–31). (C) Daytime sleep for female flies at 18°C expressing either a constitutively dominant negative Shi (UAS-Shi.K44A) (n = 15–16) or a wild-type Shi (UAS-Shi.WT) (n = 15–32) by Repo-GAL4. One-way ANOVA with Holm-Sidak post-hoc test, *p<0.05, **p<0.01, ***p<0.001. Error bars represent standard error of the mean (SEM). Based on the resistance to sleep deprivation displayed by Repo > Shi1 flies, which may represent greater sleep pressure, we closely examined daily, unperturbed sleep. Flies expressing Shi1 in all glia had significantly greater total sleep than controls (Figure 2A) at 18°C, which was consistent across independent Shi1 lines (Figure 2B) in females as well as males (Figure 2—figure supplement 1A–B). Expression of Shi1 with Repo-GAL4 at permissive temperature resulted in an equivalent number of sleep bouts across the day, but significantly longer average bout lengths in almost all lines and sexes (see exception in Figure 2—figure supplement 1A), suggesting that sleep was also better consolidated (Figure 2 and Figure 2—figure supplement 1A–B). While we did not observe an appreciable difference in resistance to sleep deprivation between 18° C and 30°C, adult Repo->Shi1 flies raised at 18°C were also shifted to 30°C for 2 days to examine if the baseline sleep phenotype could be exaggerated. The pattern of Drosophila sleep across the day is known to alter at temperatures exceeding those preferred by flies (~25°C)– with greater sleep occurring during the daytime at the expense of nighttime sleep (Parisky et al., 2016). Appropriately, when kept at 30°C, sleep loss occurred during the nighttime in all flies, but an appreciably greater amount of nighttime sleep was seen in Repo > Shi1 flies (Figure 2—figure supplement 2A). Total sleep at 30°C in experimental female flies was equivalent to that at 18 degrees (Figure 2—figure supplement 2B, and even diminished in males Figure 2—figure supplement 2C), suggesting that the effect of glial Shi1 on daily sleep is substantial even at allegedly permissive temperature. A nighttime phenotype is not seen at 18°C most likely due to ceiling amounts of sleep in controls but is clearly present at 30°C, where the temperature-dependent change in sleep pattern shifts control sleep to daytime hours. This suggests that Shi1 expression can increase sleep throughout the day. To determine whether increased sleep is the result of a partially dominant-negative Shi1 at lower temperature or the overexpression of Shi1, we compared the effects of WT dynamin (ShiWT) with ShiK44A, a constitutive dominant negative allele of dynamin. While ShiK44A is also deficient for GTP hydrolysis, it is a distinct mutation from Shi1(G273D) (van der Bliek and Meyerowitz, 1991). Expression of ShiK44A in all glia resulted in significantly elevated sleep, in particular during the day, while expression of ShiWT had no effect (Figure 2C, Figure 2—figure supplement 3 for total sleep). Given that a constitutively dominant negative dynamin phenocopies the effect of Shi1 expression at 18°C, the sleep phenotype likely arises from inhibition of dynamin by Shi1 even at the reportedly permissive temperature. As noted above, astrocytes have previously been implicated in sleep (Bjorness et al., 2016; Halassa et al., 2009; Seugnet et al., 2011). In the fly, various glial classes have been described with corresponding GAL4 drivers generated for these classes (Stork et al., 2012). Apart from astrocytes (Doherty et al., 2009), Drosophila glia include the ensheathing/wrapping glia (Doherty et al., 2009; Ito et al., 1995), cortex glia (Awasaki et al., 2008), and the two layers of the surface or blood-brain barrier glia (Awasaki et al., 2008; Schwabe et al., 2005). To determine whether any specific glial class is sufficient for the Shi1 phenotype, we expressed Shi1 at the permissive temperature using a panel of previously published GAL4 drivers targeting different glial populations (Figure 3A), with preference given to drivers which would isolate individual glial classes. Surprisingly, we did not observe a significant effect on sleep as compared to controls when using drivers expressed in astrocyte-like glia. Instead, expression of Shi1 in the subperineurial (SPG) glia of the blood brain barrier, by moody-GAL4, produced a significant increase in total (Figure 3A) and daytime sleep Figure 3—figure supplement 1. The same was true, although to a lesser extent, with the NP6293-GAL4 driver, which expresses in the perineurial glia (PG), the second layer of the fly BBB (example expression Figure 3—figure supplement 2. The cumulative sleep increase produced by the two drivers is somewhat less than with Repo-G4, which likely reflects discrepancy in driver strength, but could also suggest a role for other populations – nevertheless only the surface glial drivers were sufficient in isolation. Surface glia were also sufficient for the resistance to sleep deprivation phenotype, although only through the PG population (Figure 3—figure supplement 3Fig., S3.3). Together these data indicate an involvement of BBB glia in Shi1-mediated effects on fly sleep. Inhibition of endocytosis in surface glia is sufficient to increase sleep. (A) Total sleep at 18°C for female flies expressing Shibire (UAS-20xShi.ts1) by, from left to right, Alrm-GAL4 (n = 16, each genotype), MZ0709-GAL4 (n = 16–32), MZ0097-GAL4 (n = 16–32), NP2222-GAL4 (n = 16–32), NP6293-GAL4 (n = 29–32), moody-GAL4 (n = 16). MZ0709, MZ0097, and NP2222 experiments were loaded simultaneously and therefore share the same UAS-Control, graphed repeatedly for each to aid comparison. Significance markings shown for GAL4s in which the experimental group differed significantly from both controls. (B) Conditional expression of UAS-20xShi.ts1 using tubGal80.ts;Rab9-GAL4 at permissive (18°C) and restrictive temperature (30°C, red shading) (n = 9–19 females, mean of 4 days). (C) Exclusion of glial expression by Repo-Gal80 from the conditional expression of UAS-20xShi.ts1 by tubGal80.ts;Rab9-GAL4 at restrictive (18°C) and permissive temperature (30°C) (n = 15–16, mean of 4 days). One-way ANOVA with Holm-Sidak post-hoc test, *p<0.05, **p<0.01, *** is p<0.001. Error bars represent standard error of the mean (SEM). As an additional glial sub-type GAL4 driver, we observed that Rab9-GAL4 exhibits prominent expression in the BBB glia. To identify the BBB glial population labeled by Rab9-G4 we drove expression of a nuclear-localized GFP, which can differentiate the surface glial populations based on nuclear morphology and abundance (DeSalvo et al., 2014). The nuclei of perineurial glial are numerous and relatively small, while those of subperineurial glia are distinctively large and limited in number, consistent with the size and distribution of this glial class. The pattern of expression of nuclear GFP under the control of Rab9-G4 was typical of the subperineurial glia (Figure 3—figure supplement 2A), marking Rab9-G4 as an SPG driver. In addition, Rab9-G4 also shows some, albeit sparse, neuronal expression in the brain (Figure 3—figure supplement 2B for Repo-Gal80 images). While constitutive expression of Shi1, even at permissive temperature, with Rab9-G4 was lethal, we observed prominently enhanced sleep when Shi1 was conditionally expressed in adulthood using the TARGET system (McGuire et al., 2004) (Figure 3B). Further, conditional expression of Shi1 with Rab9-G4 in the presence of Repo-GAL80, an inhibitor of GAL4 localized to all glial cells, prevented the increase in sleep otherwise seen with this driver (Figure 3C), concomitant with elimination of barrier expression (Figure 3—figure supplement 2B). These data exclude a contribution of neuronal expression of this driver and confirm the sufficiency of the subperineurial glia for the Shi1-mediated increase in sleep. We confirmed adult-specificity of Shi1 effects by also using the TARGET system to induce Repo > Shi1 expression conditionally during adulthood. A temperature-shift increases sleep in these flies, and upon return to restrictive temperature, the sleep of experimental flies was no longer significantly different from that of controls (Figure 3—figure supplement 1B), demonstrating that the phenotype is not likely the result of permanent detrimental effects. Together these data establish that sleep increase upon Shi expression is inducible and reversible in adult animals, and is not solely a result of developmental changes. Behavioral, electrophysiological or morphological phenotypes have previously been noted from Shi1 expression at permissive temperature (Gonzalez-Bellido et al., 2009; Kilman et al., 2009). Most prominently, overexpression of Shi1 at 19°C within photoreceptor cells produces a modified ERG profile, accompanied by a decrement in endocytic vesicles and accumulation of microtubule bundles, amounting to gross morphological alteration at the ultrastructural level (Gonzalez-Bellido et al., 2009). To determine whether the morphology of fly glia is affected by Shi1 expression, we performed transmission electron microscopy (TEM) on Repo > Shi1 flies raised at permissive temperature. When viewed as a horizontal section through the fly brain, the BBB glia form the two most superficial cell layers which continuously envelope the entire circumference of the brain. The thicker and seemingly less electron-dense PG layer faces the luminal side, and the underlying SPG, considered to be the tight barrier by virtue of septate junctions, appear as a predominantly thinner layer with periodic expanded involutions and protrusions. Examination of the superficial layers reveals a dense and distinct cytoplasmic make-up in Repo > Shi1 brains. Most prominently, amassed and repeated ring-like structures, resembling the microtubule bundles previously reported (Gonzalez-Bellido et al., 2009), appear in the experimental animals but are not seen in controls (Figure 4A). Additionally, the PG layer appears relatively thinner as compared to controls. This finding shows that in glia, as in neurons, Shi1 expression even at permissive temperature results in a morphological alteration. Ultrastructural morphology and genetic analysis of Rab proteins support a sleeprelevant function of vesicle trafficking in surface glia. (A) Transmission electron micrographs of surface glia of individual Repo-GAL4 > UAS-20xShi.ts1 and Control female fly brains. Perineurial glia are the most superficial layer with subperineurial glia appearing as the generally thinner and darker layer immediately basal to the perineurial glia. White arrows indicate presence of microtubule bundles. (B) External aspect of hemolymph-brain barrier visualized by injection and fixation of Alexa647-10kd dextran in Repo-GAL4 > USA-20xShi.ts1 and control brains, demonstrating an intact barrier in both genotypes. (C) Total sleep time of RepoGS > UAS Rab CA or DN flies, in the absence of RU486. Red bars represent UAS-Rab DN and green bars are UAS-Rab CA, with two insertions available in most cases (n = 7–16, for all genotypes). Significant Rabs are those in which all DN lines were consistently and significantly different from all CA lines measured by one-way ANOVA with Holm-Sidak post-hoc test or unpaired t-test for Rab30, with *p<0.05, **p<0.01, ***p<0.001. Displayed significance value represents the largest p-value of the 3–4 comparisons. Error bars represent standard error of the mean (SEM). (D) Total sleep time of flies expressing Rab11 CA in all glia (Repo-GAL4), perineurial glia (NP6293-GAL4), and subperineurial glia (Rab9-GAL4) as compared to GAL4 and UAS controls (n = 15–30), statistics as above. The principle role of the hemolymph-brain barrier is to preserve a selective barrier preventing free exchange of hemolymph and brain interstitial fluid. To assess whether expression of Shi1 in glia compromises the general integrity of the barrier, we injected Repo >Shi1 flies with 10kD dextran conjugated to Alexa647, and dissected brains the next day for fixation and analysis by confocal microscopy. In animals with intact barriers, 10kd dextran is restricted from the brain, and forms a layer external to the surface glia (Pinsonneault et al., 2011). In both Repo >Shi1 flies as well as parental controls, the fluorescent dextran was seen at the periphery of the brain (Figure 4B) indicating that Shi1 expression does not create a leaky barrier. Taken together with the electron micrographs, these images support the finding that with Shi1 expression, general barrier integrity is intact, but intracellular morphology is altered, although the link of the altered morphology to endocytosis is unclear. To better define the relevant pathway, we sought a relatively unbiased method for perturbing trafficking. The Rab proteins are a family of membrane-bound GTPases that demarcate trafficking compartments (e.g. early, recycling, late endosomes, etc) and are known to regulate diverse vesicle movement within the cell, including exo- and endocytotic pathways. We asked which trafficking pathways are important in glia for sleep regulation by screening an existing collection of UAS-Rab lines (Zhang et al., 2007), which include both constitutively active (CA) and dominant negative (DN) constructs for the currently described Drosophila Rabs. For most Rabs in this collection, two separate insertions exist for each construct (DN and CA), and in the initial screen all available lines were crossed to a pan-glial driver, with hits defined as Rabs that showed opposing effects on sleep of all available CA as compared to all DN lines. In order to avoid potential lethality from overexpression of dominant negative constructs, we used a newly created hormone-inducible pan-glial driver, Repo-GeneSwitch (RepoGS). While lethality was not seen for any Rab using this driver, with or without RU486 feeding, we observed that expression was leaky (Figure 4—figure supplement 1A), that is not totally dependent on RU486, which has also been reported for other GeneSwitch lines (Scialo et al., 2016). Unfortunately, leakiness of RepoGS seemed particularly prominent in the surface glia, and so we examined effects of DN and CA lines on sleep in the presence and absence of RU486. When UAS-Rabs were expressed by RepoGS in the absence of RU, significant differences in sleep between DN and CA lines were found for Rab3, Rab9 and Rab11 (Figure 4C). In the presence of RU486, Rab1, Rab5, Rab27 and Rab30 were found significant (Figure 4—figure supplement 1B), albeit with only one line available for each DN and CA construct in the case of Rab30. 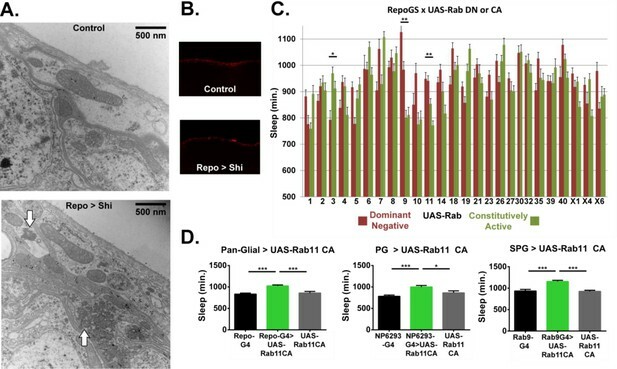 As preliminary screening compared only experimental flies (RepoGS > UAS Rab) with or without RU, the Rabs of interest were confirmed with Repo-GAL4, including the full complement of UAS and GAL4 controls. For Rab3, Rab5 and Rab9, we did not observe sleep increases by this driver (Figure 4—figure supplement 1C), and while some Rab27 and Rab30 constructs did exhibit significant increases, we did not find consistent phenotypes when these lines were expressed by surface-glial drivers (data not shown). Rab1 CA also increased sleep relative to parental controls, but given that it affects ER/Golgi transport (Kiral et al., 2018), we considered it is less likely to be mechanistically similar to Shi1. In contrast, expression of recycling-endosome associated Rab11 CA resulted in a robust sleep increase when driven in all glia (Figure 4D) and was significant for both CA lines. Unlike with RepoGS, Rab11 DN driven by Repo-GAL4 yielded lethality (Figure 4—figure supplement 1C), with no adult flies detected, which may be indicative of Repo-GAL4 as a stronger driver. Likewise, expression of Rab11 DN in either BBB population resulted in lethality (data not shown) while expression of Rab11 CA in either surface glial population was sufficient to produce increases in total sleep (Figure 4D). Unlike with Shi1, we did not see resistance to sleep deprivation with Rab11 driven in glia (Figure 4—figure supplement 2B), which could indicate more widespread alteration in trafficking by Shi1 than by Rab11 alone. Rab11 is associated with the recycling endosome, and through multiple effectors, is also necessary for endocytic transport, particularly in polarized cells (Jing and Prekeris, 2009). Together these results identify the importance of Rab11 in the surface glia, and support the role of endocytic/endosomal trafficking in the sleep function of the surface glia. Considering that inhibition of endocytic trafficking in the fly hemolymph-brain barrier increases sleep, could rates of endocytosis at the barrier depend on sleep-wake state? Recent work in mice suggests that sleep serves to promote clearance of interstitial fluid, and consequently harmful metabolites which may have accumulated as a result of sustained neuronal activity during wake, through the glymphatic system (Xie et al., 2013). Whether such clearance during sleep is a conserved feature in other organisms is currently unknown, but given that the barrier glia divide brain and body hemolymph in the fly, they are a prime candidate for regulating transport from brain interstitial fluid to the periphery as a function of sleep-wake state. In order to evaluate effects of sleep-wake state on endocytosis, we collected flies from an early night time point (ZT14 - 2 hr after lights off) and an early day time point (ZT2 - 2 hr after lights on) (Figure 5A). At ZT14, sleep pressure is typically high following daytime arousal (flies are diurnal) and a majority of flies experience consolidated sleep, while ZT2 is associated with high locomotor activity. To quantify the amount of endocytosis in the surface glia, we labeled both surface glial layers with UAS-CD8::GFP using the 9–137-GAL4 driver and dissociated the brains to allow access of fluorescence-conjugated 10 kD dextran to the basolateral surface of the barrier (as even a smaller dextran did not penetrate the brain from the apical surface of the BBB Figure 5—figure supplement 1). Dissociated brain cells were incubated for 30 min at room temperature, prior to analysis by flow cytometry (Materials and methods) (Figure 5—figure supplement 2, for gating strategy). Barrier cells from flies at ZT14 contained significantly higher dextran, suggesting that endocytosis is favored by high sleep or sleep need (Figure 5A). To verify that incorporation of dextran into GFP+ surface glial cells reflects endocytosis, samples were also pre-incubated with dynasore (Macia et al., 2006), an inhibitor of GTP hydrolysis in dynamin family proteins. At all time points, the AF-dextran signal was significantly diminished by the presence of dynasore (Figure 5A), indicating that a substantial portion of the signal is due to endocytosis. Sleep promotes endocytosis at the surface glia. Brains (n = 20, per condition in experiment) from 9-137 GAL4, UAS-CD8::GFP flies were dissected, dissociated, and the samples incubated with Alexa647-conjugated 10kd dextran in the presence or absence of the dynamin inhibitor, dynasore hydrate. Endocytosis measured from surface glial cells by AF647-Dextran signal, expressed as normalized median fluorescence intensity (MFI) (left) and percentage of cells with high endocytosis signal (right). Dextran MFI is normalized to the average MFI of the DH-treated samples. Paired Student’s T-test with *p<0.05 and **p<0.01. Percentage of GFP+ cells displaying high signal with vehicle conditions was normalized to inhibitor for each respective timepoint to compare between experiments. One-way ANOVA with correlated measures with post-hoc Tukey’s test with *p<0.05 and **p<0.01. (A) Endocytosis at ZT2, ZT2 following sleep deprivation (12 hr, mechanical stimulation) and ZT14 (n = 4 per time point, pooled from four experiments). (B) Endocytosis at night time points ZT14, ZT18, and ZT22 along with ZT2 (n = 4, pooled from four experiments). (C) Endocytosis at ZT2 after feeding of 0.1 mg/mL Gaboxadol or vehicle (n = 3, pooled from two experiments). Given that a difference between ZT14 and ZT2 may be indicative of a circadian effect, independent of sleep-wake state, we evaluated flies at an identical time-point (ZT2), but following sleep deprivation (SD). Flies in the SD condition were mechanically sleep deprived for 12 hr beginning at ZT12 and ending at ZT0, and allowed 2 hr to recover, before also being dissected at ZT2. Hence, circadian time is equivalent between SD and non-SD animals, but flies recovering from SD should have greater sleep pressure. We find that flies taken from a state of recovery sleep following deprivation show substantially higher rates of endocytosed AF-dextran than their un-deprived controls at ZT2 (Figure 5A) – a level of endocytosis commensurate to that from flies at ZT14. Brains collected at 6 hr intervals over the course of the 24 hr day showed a rhythmic pattern, which was not significant as a circadian cycle by JTK, but indicated lowest and highest levels of endocytosis at ZT2 and ZT14, respectively (Figure 5—figure supplement 3B). To determine when endocytosis declines after the peak at ZT14, we assessed rates over the course of sleep to find that endocytosis is higher at ZT14, as compared to ZT18, ZT22 and ZT2, which are not statistically distinguishable (Figure 5B). This would suggest that endocytosis at the barrier is maximal and largely accomplished within the first half of the night. Since enhanced endocytosis at ZT2 following sleep deprivation could be a result of stress rather than enhanced sleep, we fed the sleep-inducing drug, Gaboxadol (GBX) (otherwise known as THIP) (Berry et al., 2015; Dissel et al., 2015; Wafford and Ebert, 2006). While exposure to Gaboxadol during the day did not alter the high endocytosis observed at ZT14 (Figure 5—figure supplement 3A), Gaboxadol-treated flies showed increased endocytosis at ZT2 (Figure 5C). Together these findings demonstrate that endocytosis at the hemolymph-brain barrier occurs preferentially during sleep and reflects sleep need. It is normally high during the early night when sleep predominates but can be increased in the early day if flies undergo recovery sleep following deprivation the prior night or if they are induced to sleep by drug treatment. Glial cells are an important constituent of blood or hemolymph-brain barriers, a conserved feature of complex organisms that protects the central nervous system from unregulated exchange with humoral fluids. In this study, we show that manipulations of endocytosis and vesicular trafficking in the surface glia, particularly the subperineurial glia of the fly BBB, are sufficient to elevate baseline sleep amounts, and that at the BBB, endocytosis itself is influenced by sleep-wake state. Our findings expand the scope of glial involvement in sleep and suggest that trafficking through hemolymph- or blood-brain barriers is an underexplored determinant of sleep-wake behavior. Expression of Shibire1 has been a popular method to probe circuit-level influence on various fly behavior, with the prevailing interpretation being that exposure to non-permissive temperature abrogates synaptic transmission via an eventual depletion of the synaptic vesicle pool -- a consequence of inhibited endocytosis. Ultrastructural work in neurons has revealed, however, that expression of Shibire1 at the lower limit of permissive temperature markedly alters electrophysiological properties and intracellular structures (Gonzalez-Bellido et al., 2009), which we also now find in glia. The microtubule defects we report in glia support cellular effects of Shibire1 at permissive temperatures, although they are not necessarily related to behavioral phenotypes of Shibire1 expression in glia (this work) or neurons (Kilman et al., 2009) under these conditions. Evidence for dynamin interaction with microtubules has primarily been from early in vitro experiments (Ferguson and De Camilli, 2012), with in vivo work showing that only certain dynamin mutations alter microtubules (Tanabe and Takei, 2009), underscoring a potentially separable impact of dynamin on endocytosis and microtubules. Shibire1 expression in Drosophila astrocytes was previously shown to disrupt circadian rhythms (Ng et al., 2011), but those experiments were designed to prevent expression of Shibire1 at permissive temperatures, leaving open the question of whether other glial phenotypes are independent of temperature. Interestingly, this study showed a decrement in rhythmicity upon expression of Shibire1 at non-permissive temperature in either of the surface glia, although the total percentage of rhythmic animals was unaffected (Ng et al., 2011). While sleep was not directly analyzed, a loss of robustness might be explained by increased sleep, present in the context of otherwise intact daily activity patterns. In our experiments, conditional expression of Shibire1 in the surface glia or all glia of adult flies was sufficient to increase sleep, demonstrating that while a phenotype is evident at permissive temperature, it is likewise inducible in adulthood and therefore cannot be accounted for by developmental effects. Dynamin (Shibire) is known to be fundamental to endocytosis and vesicle formation. Nevertheless, the stages of vesicular trafficking are intimately linked, making it difficult to exclusively manipulate, even at the level of molecular machinery, the processes of endocytosis and exocytosis (Wu et al., 2014). Indeed, SNARE family members such as synaptobrevin, considered to be specific to exocytosis, have also been found to affect endocytosis (Xu et al., 2013; Zhang et al., 2013). Therefore, we cannot exclude a contribution of exocytotic processes to the influence of the barrier on sleep, although our data clearly implicate endocytosis in barrier cells. Rab GTPase family members orchestrate vesicular and membrane traffic within cells including glia (Dunst et al., 2015; Ng and Tang, 2008) and the BBB, although knowledge of their roles in these populations has been limited. Knockdown of the microtubular motor protein, kinesin heavy chain (Khc), results in locomotor deficits attributable to developmental alterations in subperineurial glia (Schmidt et al., 2012), and also seen with pan-glial Rab21 knockdown. While dynamin also could interact with microtubules, we did not observe locomotor deficits in flies expressing Shibire1. Through screening of available CA and DN Rab constructs, we identified Rab11 as important for sleep regulation in the barrier glia. We find that Rab11 CA expression, like Shibire1, produces increases in total sleep when driven in the barrier populations. Constitutive expression of a dominant negative Rab11 is lethal when present in all glia or even just in surface glia, underscoring the importance of this Rab in barrier cells. Rab11 is considered a marker of the recycling endosome compartment, regulating recycling of plasma membrane constituent proteins, although evidence also links Rab11 to more direct participation in early endocytosis. For example, Rab11 functions in Drosophila astrocytes to regulate endocytosis of the GABA transporter (GAT) (Zhang et al., 2017) and Rab11 knockdown has been shown to inhibit endocytosis and transcytosis of LDL in human iPSC-derived neurons (Woodruff et al., 2016). Considering that DN and CA mutations of Rab11 can alter trafficking in the same direction in some conditions (Khvotchev et al., 2003), it is possible that Rab11CA inhibits endocytosis at the BBB. Alternatively, Rab11CA could produce a similar phenotype to Shi1 by a different, but related mechanism. For example, while Rab11 DN inhibits recycling of plasma membrane components (Kiral et al., 2018), Rab11 CA could enhance recycling. If the mechanism underlying sleep increase at the BBB involves trafficking a particular receptor then according to this model, both inhibiting endocytosis and enhancing recycling would keep this receptor at the membrane. While we demonstrate that interference with vesicle trafficking and endocytosis at the BBB can alter sleep, and endocytosis in these populations is affected by sleep-wake state, the nature of the sleep-relevant substrates or molecules remains to be determined. The hemolymph-brain barrier, like its mammalian counterpart, contains numerous transporters and receptors (DeSalvo et al., 2014) serving to selectively move nutrients and metabolites in, and deleterious compounds such as xenobiotics out. Mutants for the xenobiotic transporter, Mdr65, show greater total sleep, but effects have not been directly mapped to the barrier (Hindle et al., 2017). We demonstrated recently that efflux transporters in the Drosophila BBB are under circadian regulation such that they preferentially pump out xenobiotics during the day. At night, a decrease in transporter activity increases permeability of xenobiotics into the brain (Zhang et al., 2018). Based on our current findings, we suggest that activities of the BBB are temporally compartmentalized, such that efflux occurs during the day and endocytosis at night. However, endocytosis is dependent on sleep and sleep history rather than the circadian clock as it will occur during daytime recovery sleep following sleep deprivation at night. Neurotransmitter/modulator levels are known to influence, and vary according to, sleep-wake state (Sehgal and Mignot, 2011) and are regulated by glial populations, which could include the BBB glia. To determine if this was the case, we assessed biogenic amine and amino acid content in the brains of Repo > Shi1 flies, but found no consistent differences relative to controls (Figure 5—figure supplement 4). In mammals, a glymphatic system, involving aquaporin channels in astrocytes, promotes flow of interstitial fluid along the brain vasculature and mixing with cerebrospinal fluid to allow exchange of brain fluids and clearance of waste products (Iliff et al., 2014; Xie et al., 2013). Interestingly, this flow is enhanced during the sleep state (Xie et al., 2013). Drosophila, as other invertebrates, possess an open circulatory system and thereby lack vasculature within the brain. Nevertheless, separation between the interstitial fluid of the brain and the hemolymph at large is maintained by the hemolymph-brain barrier. Our finding of a role for barrier glia in fly sleep, and the influence of sleep state on endocytosis at the barrier, supports the possibility that clearance or interstitial exchange is a conserved function of sleep. As we find that peripherally injected 10kd dextran does not enter the brain, we speculate that sleep-dependent endocytosis in dissociated BBB cells reflects trafficking from, rather than to, the brain. We suggest that BBB endocytosis occurs during sleep to resolve products of wakefulness and thereby restore metabolic/neural homeostasis, which would account for the increased sleep need that results from a block in endocytosis. In other words, endocytosis would be highest during sleep, and decrease during the night as sleep pressure is resolved. Flies with inhibited endocytosis would be unable to perform this function and resolve sleep pressure, and would in consequence exhibit constantly elevated sleep. By this model, administration of Gaboxadol increases sleep pressure and so is associated with high endocytosis at ZT2 and ZT14, regardless of the baseline levels of endocytosis at these time points. Sleep was previously linked to permeability of the BBB in rodents, where sleep loss, and even just REM restriction, was shown to increase BBB permeability (Gómez-González et al., 2013; He et al., 2014; Hurtado-Alvarado et al., 2016). These effects were attributed to adenosine (Hurtado-Alvarado et al., 2016), which is also considered a somnogenic molecule (Porkka-Heiskanen and Kalinchuk, 2011). In fact, adenosine may be relevant to the interaction between astrocytes and sleep (Fujita et al., 2014; Halassa et al., 2009; Schmitt et al., 2012). Given that astrocytes contribute to the mammalian BBB (Abbott, 2002), it is possible that sleep effects produced by inhibiting astrocyte signaling (Halassa et al., 2009) involve secondary effects on the BBB. Drosophila sleep studies have focused on neuronal circuits controlling sleep-wake (Artiushin and Sehgal, 2017; Dubowy and Sehgal, 2017), with comparatively few studies investigating the contribution of glia to this circuitry. We identify the barrier glia as regulators of sleep and propose that endocytic trafficking through the barrier is an important function of the sleep state. The specific differences between mammalian and invertebrate barriers notwithstanding, the identification of the glial/endothelial barrier as a population that can mediate changes in daily sleep aligns with emerging ideas of BBB involvement in behavior (Hoxha et al., 2013; Parkhurst et al., 2018) and sleep function (Pan and Kastin, 2017; Verheggen et al., 2018), and provides a readily identifiable cellular target to interrogate in other model organisms. Stocks present in the lab collection include—; ;Repo-GAL4/TM3,Sb and UAS-Shi.ts1; UAS-Shi.ts1 (referred to as UAS-Shi1 in the text) and UAS-CD8::GFP and UAS-nGFP. For control genotypes, GAL4 and UAS lines were crossed to iso31. ; ;UAS-20xShi.ts1 (referred to as UAS-20xShi1) was shared by Gerald Rubin. UAS-Shi.WT and UAS-Shi.K44A were shared by Konrad Zinsmaier. NP2222-GAL4, NP6293-GAL4, Alrm-GAL4, MZ0709-GAL4, MZ0097-GAL4 were shared by Marc Freeman. Moody-GAL4 and 9–137 GAL4 was shared by Roland Bainton. UAS-Rab CA and DN lines were acquired from the Bloomington Drosophila Stock Center. Rab9-GAL4 (#51587) was also acquired from Bloomington. To generate the; ;Repo-GeneSwitch 2301 line a 4.2 kb genomic fragment (between coordinates 18231884 and 18236068, FlyBase release 6.19) was amplified by PCR and cloned into a PUAST-AttB-Sfi-GeneSwitch vector. Transgenesis for this construct was performed by BestGene at landing site AttP154 (97D2). Flies were raised in bottles on standard food at either room, or non-permissive temperature (18–19°C) for Shibire and TARGET system (McGuire et al., 2004) experiments. For sleep recording, flies were loaded into glass locomotor tubes containing 5% sucrose in 2% agar, and additionally 0.5 mM RU-486 (mifepristone) in the case of GeneSwitch experiments. Locomotor data was collected using the Drosophila Activity Monitoring (DAM) System (Trikinetics, Waltham, MA) and processed using PySolo(Gilestro and Cirelli, 2009). Data are processed as 1 min bins, with sleep defined as 5 min without activity. Activity index refers to the average number of beam crossings within an active bout. Sleep deprivation was performed by mechanical disruption using a vortexer triggered to shake randomly for 2 s out of every 20, for the span of 12 hr beginning at lights-OFF, ZT12. Flies were kept in incubators under 12 hr light: 12 hr dark (LD12:12) cycles and constant temperature (25°C or 18°C or 30°C). In the case of the initial temperature shift experiments with Shibire1, flies were kept at 18°C, and shifted to 30°C for the duration of the night, before being returned to 18°C at lights-ON, ZT0. For behavioral experiments, adult flies of at least 6-days post-eclosion were used, except in the case of tubGal80.ts experiments, where younger flies were loaded to grant additional time to compensate for the loss of strength due to incomplete de-repression of tubGal80.ts. Fly brains were fixed in 4% PFA in PBS with 0.1% TritonX-100 for 15–20 min, and washed in PBST for 30 min at room temperature, before mounting in VectaShield H-1000 (Vector Laboratories). Confocal imaging was performed on a Leica TCS SP5. Heads from female Repo > UAS-20xShi1 flies approximately two weeks post-eclosion were dissected in a cold room in PBS and fixed with 2.5% glutaraldehyde, 2.0% paraformaldehyde in 0.1M sodium cacodylate buffer, pH7.4, overnight at 4°C. Samples were post-fixed in 2.0% osmium tetroxide for 1 hour at room temperature, and rinsed in DH2O prior to en bloc staining with 2% uranyl acetate. After dehydration through a graded ethanol series, the tissue was infiltrated and embedded in EMbed-812 (Electron Microscopy Sciences, Fort Washington, PA). Flies were not strictly circadian entrained or taken at an exact time of day, but dissections were performed together in the afternoon. Reported images represent sections from single flies from each genotype, although the experimental was compared to both parental controls. The described microtubule structures were not seen in the controls. Embedding, staining and sectioning was performed by the Electron Microscopy Resource Laboratory at Penn. Thin sections were stained with uranyl acetate and lead citrate and examined with a JEOL 1010 electron microscope fitted with a Hamamatsu digital camera and AMT Advantage image capture software. Integrity of the barrier was assessed as previously described (Pinsonneault et al., 2011). Female flies were injected with Alexa fluor 647-conjugated 10 kd dextran (ThermoFisher D22914) the day before dissection and kept in standard food vials. Heads were removed and fixed in 4% PFA in PBS for 10–15 min before brains were further dissected out and cleaned. Brains were additionally washed in PBS for 30 min before being mounted in VectaShield H-1000 (Vector Laboratories) and imaged by confocal microscopy. The brains of female flies ranging from 10 to 20 days post-eclosion were dissected in cold PBS, and collected to 20 brains per vial. Excess PBS was pipetted off after spinning the samples down by micro-centrifuge. The samples were frozen on dry ice and submitted to the Children’s Hospital of Pennsylvania Metabolomic Core for HPLC analysis. Flies expressing membrane bound GFP in the surface glia (9–137 GAL4;UAS-CD8::GFP) were dissected in ice-cold AHL (108 mM NaCl, 5 mM KCl, 2 mM CaCl2, 8.2 mM MgCl2, 4 mM NaHCO3, 1 mM NaH2PO4-H2O, 5 mM trehalose, 10 mM sucrose, 5 mM HEPES; pH 7.5), and 20 brains were collected per condition. To each sample, 60 μL of Collagenase IV (25 mg/mL) and 10 μL of DNase I (1 mg/mL) were added. Following shaking at 37°C for 15 min, brains were broken up by 3 rounds of gently pipetting. Using a 70-μm cell strainer, the brain samples were then transferred to FACS tubes, to which 3 mL of AHL was added and spun down for 5 min (2500 RPM). After removing the supernatant, the pellet was resuspended in AHL and brought to a volume of 200 μL, at which point the sample was split into two new FACS tubes of 100 μL each. One tube received an additional 50 μL of vehicle solution while 50 μL of dynasore hydrate solution (10 μM final concentration) was added to the other. The samples were mixed well and incubated at room temperature for 10 min. Following incubation, 50 μL of Alexa fluor 647-10kd dextran (50 μg/ml final concentration) was added to each tube, mixed, and incubated at room temperature for 30 min. 4 mL of FACS buffer (0.5% BSA w/v + 0.1% w/v sodium azide in PBS) were added to each tube, spun down and the supernatant removed. Samples were immediately analyzed using a FACS Canto II (BD Biosciences). Gaboxadol hydrochloride (Cayman Chemical Company) was added to standard 5% sucrose in 2% agar food in locomotor tubes at 0.1 mg/mL. For the ZT14 timepoint, flies were flipped to Gaboxadol food at lights ON (ZT0) while for the ZT2 timepoint they were flipped onto drug just before lights OFF (ZT12). In both cases, they remained on this food for ~14 hr until dissection. 6-cm plates were coated with poly-L-lysine (0.01%) for greater than 10 min, removed, and let dry. Brains were dissected in AHL, placed on the coated plates, and incubated with 50 μL droplet of 500 μL/mL 3kD FITC-conjugated dextran and either imaged continuously for 10 mins or dye was washed off and brains were imaged in AHL for 5 min. Confocol imaging was performed with 20x submergible water objective (with the lens touching the dye droplet) at excitation/emission wavelengths of 488/520. For a permeable dye, brains were dissected in AHL and incubated with 50 μL droplet of 125 μL/mL Rhodamine B and imaged continuously for 10 min. Imaging was performed with 20x submergible water objective at excitation/emission wavelengths of 543/555. Graphs and statistical tests were completed using Excel and GraphPad Prism. FACS analysis was performed in FlowJo. For measures of sleep, Controls (GAL4 alone and UAS alone) were compared to Experimental (GAL4 > UAS) animals by one-way ANOVA with Holm-Sidak post-hoc correction. 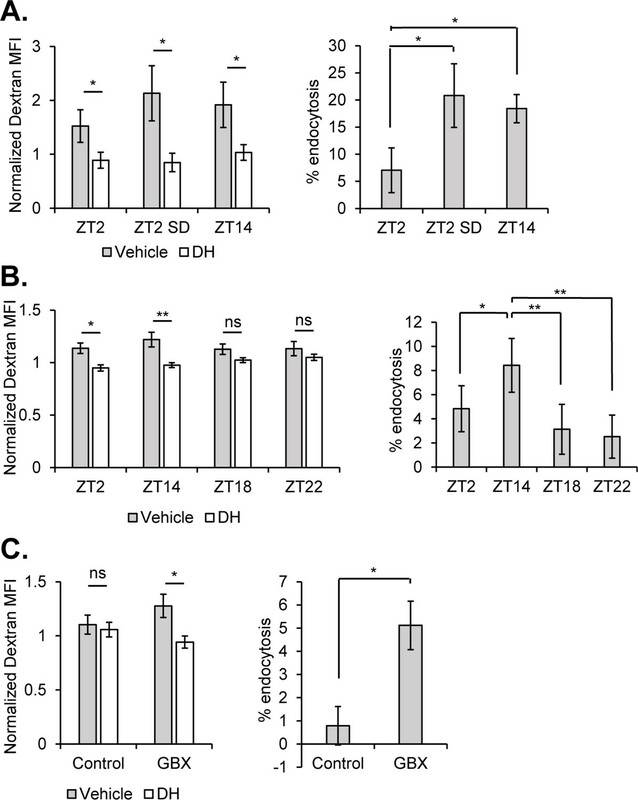 For comparison of endocytosis between ZT2 and ZT14 or ZT2 and ZT2 SD or between each time point control and inhibitor, Students’ T test was performed. Additional details regarding tests and significance values are provided in the figure legends. Current Opinion in Neurobiology 44:243–250. The Journal of Neuroscience 37:5263–5273. The Journal of Neuroscience 36:3709–3721. The Journal of Neuroscience 37:4289–4300. Nature Reviews Molecular Cell Biology 13:75–88. The Role of Glia in Sleep Regulation and Function, Handbook of Experimental Pharmacology, Springer, Berlin, Heidelberg, 10.1007/164_2017_87. Journal of Immunology Research 2016:1–15. The Journal of Neuroscience 34:16180–16193. The Journal of Neuroscience : The Official Journal of the Society for Neuroscience 23:10531–10539. Current Biology : CB 21:625–634. Frontiers in cellular neuroscience 9:256. The Neuroscientist : A Review Journal Bringing Neurobiology, Neurology and Psychiatry 23:124–136. Methods in Molecular Biology 686:357–369. Cold Spring Harbor Protocols, 10.1101/pdb.top067587. The Journal of Cell Biology 185:939–948. Neuroscience & Biobehavioral Reviews 90:26–33. Current Opinion in Pharmacology 6:30–36. Annual Review of Physiology 76:301–331. Thank you for submitting your work entitled "Endocytosis at the blood-brain barrier as a function for sleep" for consideration by eLife. Your article has been reviewed by a Senior Editor, a Reviewing Editor, and three reviewers. The following individuals involved in review of your submission have agreed to reveal their identity: Paul Taghert (Reviewer #3). Our decision has been reached after consultation between the reviewers. Based on these discussions and the individual reviews below, we regret to inform you that your work will not be considered further for publication in eLife. However, we do feel the work could be made acceptable but only after the essential changes noted below are handled experimentally. Should you choose to submit a new version of this work, we will endeavor to have it reviewed by the same Board member and referees. This paper explores the functional contributions of the blood brain barrier (BBB) to sleep regulation in Drosophila. It uses a full range of genetic cellular and imaging methods to consider the hypothesis that endocytosis/exocytosis in BBB glia changes in ways that supports the role of these cells in helping resolve levels of metabolites that increase in relation to sleep-need. Further it provides evidence for the involvement of glial Rab11 in the cellular mechanism. Experimentally analyzing glial function in sleep, the work touches an aspect of brain physiology that has just begun to be explored but that has been proposed as one of the crucial functions of sleep. Thus, this work is a potentially significant contribution of interest to a general audience. Though work is clearly described, thorough in most aspects and also several caveats are clearly acknowledged, there are issues that need to be clarified and conclusions that need to be strengthened in order to better establish the key conclusion of the paper that inhibition of endocytosis in glia increases sleep. 1) The authors nicely describe various difficulties experienced with genetic tools to perturb endocytosis in targeted glia (e.g. temperature-independent and potentially endocytosis-independent effects of shi-ts expression, as well as leaky GsGal4 expression). In addition, they report similar effects on sleep following expression of constitutively active and dominant negative forms of Rab11 as well as perturbation of Rabs that may not participate in endocytosis (Figure 4 and Figure 4—figure supplement 1). Thus, it is important to better establish sleep phenotypes arise from changes in endocytosis rather than non-specific glial malfunction. Some suggestions of additional experiments to support the hypothesised role of endocytosis are proposed below. 1a) To better characterise sleep-associated endocytosis, it would be useful to measure rates of endocytosis at 4-6 time points to define a daily cycle, not just two time points. 1b) Given the possibility that even adult-specific expression of mutant dynamin or Rab RNAi can have long-lasting changes in glial physiology or alterations in BBB permeability, it would be useful to test if these flies revert to normal sleep behaviour if allowed to recover for an appropriate period of time. 1c) To show that a different amount of sleep deprivation (more or less) produces a proportionate change in endocytosis (i.e., two or more points on the concentration-effect curve). 1d) To show bidirectionality of regulation and to control for potential contribution of stress rather than sleep drive, the authors should test whether endocytosis following more sleep is reduced (this may require orthogonal genetics: e.g. to drive sleep-inducing FB neurons). 2) Different Gal4 lines are used to target subsets of glia. The specificity of these lines needs to be clearly documented. The logic for using one or other for different experiments needs to be clarified. And at least one case, an additional Gal4 may need to be used. 2a) The description of Gal4 expression lines (Figure 3—figure supplement 2) should be expanded Critically, to demonstrate that each one the Gal4s used is indeed expressed preferentially in glia, the figure should include counter stains with glia or neuron-specific antibodies (Repo and Elav, respectively). Glial-specific expression would be also more convincing if the authors could test how well the expression pattern of these Gal4s (Rab9-Gal4 in particular) is blocked by Repo>Gal80. (More minor, it might help if an outline of the brain were drawn). 2b) The tubGal80.ts experiments utilize Rab9-Gal4. To more convincingly implicate the glial cells presumed to be targeted, these experiments should also be repeated with Moody-Gal4 (and possibly Repo-Gal4 as well). 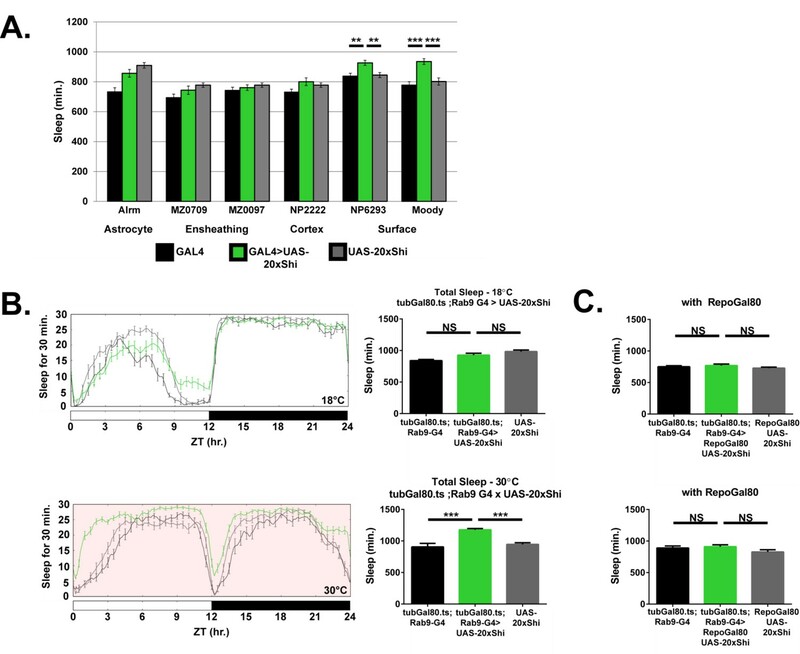 3) Figure 1 shows that of Shi-ts expression in glia induces resistance to mechanical stimulation during sleep. Can a control experiment be done to rule out the possibility of a sensory defect that makes these flies unresponsive to mechanical stimulation? E.g. To test the responsiveness of awake Repo>Shi flies to mechanical stimulation? On this note, are the PG and SPG drivers expressed outside the brain in sensory structures? 4) Is it necessary to dissociate cells before adding Alexa647-dextran? Why not measure before dissociation as most cellular processes including endocytosis could be more robust in an intact brain. If it is simply to allow access to Alexa647-dextran, then could an alternative smaller endocytic tracer be tried? 5) Is resistance to mechanical stimulation following SD specific only to Shi, or also seen following endocytic Rab manipulation? 6) The shi-ts expression results suggest that sleep during SD happens at both temperatures, but nighttime sleep seems to elevated sooner in both males and females at 18 degrees, than in controls. Is this impression correct? and if so, is there an explanation? This difference (if reproducible) involves latencies and time of day differences. The fly sleep literature appears to point to an increasing fragmentation of cellular mechanisms between those that affect daytime versus nighttime sleep. Is there any basis to think or expect that the cell biological mechanisms (exo- and endocytosis) should be geared to daytime versus nighttime? 7) Figure 2C suggests that the effects of Shi-ts on sleep are not due to merely overexpression of Dynamin since the expression of Shi-wt does not have a significant effect. However, for Shi-wt, only total sleep is shown, whereas the main effect for Shi-ts at 18C is on day sleep. To exclude the possibility that a Shi-wt effect on sleep is masked when only total sleep is shown the figure should be revised to include data showing the effect of Shi-wt on daytime sleep. 8) Indeed, it would useful to consistently show data for total sleep and daytime sleep for all genotypes in the paper (these data must be available). 9) In Figure 3A, to exclude possible effects due to expression of Shi in neurons (in addition to expression in the BBB glia), the authors could show that these phenotypes remain when the expression in all glia is blocked using Repo>Gal80. 10) It would be valuable to test, with existing tools, to what extent surface glia are responsible for the phenotypes observed with the pan-glial driver, Repo. Does Shi expression in surface glia also cause resistance to mechanical sleep deprivation? Is the phenotype of either NP6293 or moody >Shi weaker than that of Repo>Shi and does combining NP6293 and moody Gal4s generate a phenotype comparable to that of Repo-Gal4? Why is the 9-137-Gal4 driver (SPG & PG) that is later used in Figure 5 (subsection “Endocytosis occurs during sleep and is influenced by prior wakefulness”) not used here? 11) Figure 3 localizing effect to surface glia: In Figure 3A – which UAS-shi was used? The effect does not appear to match that of repo-Gal4. The difference is no more than 100 min; whereas. in Figure 2A, the difference is >200 min. Is this lack of quantitative matching significant? Maybe it reflects the strength of the Gal4s but alternatively it could mean that other cells contribute. This should be discussed. 12) In the same figure – the lack of effect of astrocyte expression seems to be correlated with an unusually high value for the UAS control. Is there a reason to be concerned here? 13) Regarding EM images in Figure 4A – how abundant and frequent are these ultra-structural changes and how do they correlate with sleep phenotypes? The observations themselves (amassed ring-like structures resembling microtubules, and a thinner PG layer) are only described to the level of positioning of two arrows in one of the micrographs. There should be some definition of the phenotypes and indication of prevalence, severity or quantification (either within or between animals). Were the suspected MTs coated or bridged as originally described in the paper cited? There no details provided in the methods regarding gender, time of day, age, or "n" value. In addition, it would be useful to know if these are also seen following induction of wild-type dynamin, because WT-dynamin expression does not cause sleep phenotypes and there is the potential to examine how relevant these ultrastructural defects might be to the sleep effects observed. (Perhaps the cited EM paper has addressed this issue in neurons?) Are there any changes in membranes or vesicular structures that could potentially be connected to a block in endocytosis? What is the predicted EM phenotype associated with Rab11 CA expression? 14) Is the overall structural integrity of BBB, as shown in Figure 4B, also preserved when Rab11CA is expressed in glia? 15) In Figure 4C, the significance is determined based on a difference between DN and CA allele of each Rab protein. Is this the best criterion? Wouldn't it be better to compare each manipulation to the parental controls? In any event, it should be made clear why only Rab11 and not others is deemed to have crossed a significance threshold. 16) The overall logic that explains the link between the manipulations, endocytosis and sleep is confusing. Glial expression of Rab11CA increases sleep, similarly to Shi-ts. Do the authors propose that Rab11CA inhibits endocytosis, similarly to Shi-ts? 17) On similar lines, the data shown in Figure 4C seem to contradict the data in Figure 4D. In Figure 4D, Repo>Rab11CA causes increased sleep, compared to parental controls. Figure 4C, shows that using the RepoGS driver, Rab11 DN induces even more sleep than Rab11CA. Thus, both of these opposing manipulations cause increased sleep. Could it be that both manipulations simply make glial cells sick, and therefore, in both cases, sleep is increased due to malfunction of glia, and not due to specific changes in endocytosis? The possibility for a non-specific effect is supported by similar data in Figure 4—figure supplement 1C, where expression of either DN or CA versions of Rab27 and Rab30 produces exactly the same phenotype of increased sleep, unless the authors believe that these also work by affecting endocytosis. These issues should be explained and addressed in a revised manuscript. 18) In Figure 4—figure supplement 1B – are the effects of Rab3, Rab9 and Rab11 that were significant in Figure 4A (without RU486) still significant in the Figure 4—figure supplement 1B (with RU486)? The significance stars in Figure 4—figure supplement 1B are shown only for Rab1, Rab5, Rab27 and Rab30. 19) The apparent contradiction between Figure 1, Figure 2, Figure 3, Figure 4 and Figure 5 should be more clearly explained. Figure 5 shows that SD (which increases sleep pressure) causes increased endocytosis, but, Figure 1, Figure 2, Figure 3 and Figure 4, show that inhibiting endocytosis actually increases sleep, suggesting that endocytosis in BBB promotes wakefulness. An explanation that connects the two observations should be included. 20) Are the changes in endocytosis that correlate with sleep state specific only to surface glia? Are there changes in endocytosis in other populations of glial cells, as function of sleep? In this manuscript, Artiushin et al., aim to explore the role of glia endocytosis in sleep regulation focussing on a Drosophila model of the blood-brain barrier. The work is very interesting in principle as it touches an aspect of brain physiology that has been hardly explored so far but that has been proposed as one of the crucial functions of sleep. The manuscript is well written in general and the experiments are well reported. The main weakness of the work is that in almost all experiments the genetic tools adopted did not behave as expected. The temperature sensitive form of shibire, (which is instrumental for experiments in Figure 1, Figure 2 and Figure 3) does not appear to provide any specific insight, possibly due to a temperature insensitive activation. The repoGENESwitch tool (instrumental for experiments in Figure 4) does not seem to be properly responsive when it comes to controlling activation. All in all, the fact that the genetic tools employs are not behaving appropriately is a major weakness for the study as it is basically impossible to understand the exact specificity of the effect in terms of timing. For instance, it is impossible to exclude that this a developmental effect. Presentation of data could be improved. # There is no reason to limit labelling of panels within figures. Please use more letters, ideally one per panel. It facilitates discussion. # Please quantify the observations collected using electron microscopy? Most of the manuscript (Figure 1, Figure 2, Figure 3 and Figure 4) describes how manipulating glia affects sleep. Overall, the behavioral phenotypes are strong. However, there are multiple issues with specificity of the methods, with data representation and with the interpretation of some of the results. Another question is – is it really so surprising and interesting that manipulating large numbers of glial cells has an effect on brain function, and sleep in particular? The second part (Figure 5) is more interesting and promising, as it provides evidence for correlation between sleep/wake states and the rate of endocytosis in BBB glia. However, this part needs further development. Also, the link between this part and the rest of the manuscript seems a bit artificial, as they do not really support or complement each other well. 1) The authors show in Figure 1 that expression of the temperature sensitive allele of dynamin, Shi-ts in glia induces resistance to mechanical sleep deprivation. The authors show that the basal wake activity of these flies is not affected. However, another interpretation of the data should be considered. These flies may be unresponsive to mechanical stimulation. The authors should test the responsiveness of awake Repo>Shi flies to mechanical stimulation. The authors should also check if Repo>Shi provides resistance to sleep deprivation induced by alternative methods (thermo-genetic). Finally, the authors test the effects on SD only with Shi, but do not do it with the rest of manipulations, presented later in the paper, such as expressing mutant Rab proteins. Are the effects on resistance to SD specific only to Shi, but not to other manipulations of endocytosis? 2) The authors observe strong effects for the temperature sensitive Shi allele even at the permissive temperature of 18C. This raises the question whether Shi is a good tool in this specific system. The main concern is that the observed phenotypes are mostly due to non-specific effects that make the glial cells sick. The authors should, at least, test if knocking down the endogenous Shi using RNAi produces a phenotype similar to expressing dominant negative Shi. 3) The authors claim in Figure 2C, that the effects of Shi-ts on sleep are not due to merely overexpression of Dynamin since the expression of Shi-wt does not have a significant effect. However, for Shi-wt, only total sleep is shown, whereas the main effect for Shi-ts at 18C is on day sleep. Could it be that the effect of Shi-wt on sleep is masked when only total sleep is shown? The authors should demonstrate the effect of Shi-wt on day sleep. 4) In Figure 3A, to exclude possible effects due to expression of Shi in neurons (in addition to expression in the BBB glia), the authors should show that these phenotypes remain when the expression in all glia is blocked, using Repo>Gal80. 5) To what extent are surface glia responsible for the phenotypes observed with the pan-glial driver, Repo? For instance, does Shi expression in surface glia also cause resistance to mechanical sleep deprivation? Is the phenotype of either NP6293 or moody >Shi weaker than that of Repo>Shi? Will combining both NP6293 and moody Gal4s (SPG & PG) generate a phenotype comparable to that of Repo-Gal4? Why don't the authors use here the 9-137-Gal4 driver (SPG & PG) that is later used in Figure 5 (subsection “Endocytosis occurs during sleep and is influenced by prior wakefulness”)? 6) The images in Figure 3—figure supplement 2 should be of better quality. The outline of the brain should be drawn. The authors also should demonstrate that each one the Gal4s used in this Figure is indeed expressed preferentially in glia by co-staining with glia or neuron-specific antibodies (Repo and Elav, respectively). The glia-specific expression would be also more convincing if the authors could show the expression pattern of these Gal4s (Rab9-Gal4 in particular) when the expression of the UAS-nGFP reporter is blocked in glia, using Repo>Gal80. 7) The EM images in Figure 4A – how abundant and frequent are these ultra-structural changes? Are these changes also observed upon the expression of Rab11CA? Also, could the authors detect any accumulation of vesicles that cannot be secreted due to expression of mutant Shi? 8) Is the overall structural integrity of BBB, as shown in Figure 4B, also preserved when Rab11CA is expressed in glia? 9) In Figure 4C, the significance is determined based on a difference between DN and CA allele of each Rab protein. Is this the best criterion? Wouldn't it be better to compare each manipulation to the parental controls? Also, what would be the effect of overexpressing WT versions of these Rab proteins? 10) The overall logic that explains the link between the manipulations, endocytosis and sleep is confusing. Glial expression of Rab11CA increases sleep, similarly to Shi-ts. Do the authors propose that Rab11CA inhibits endocytosis, similarly to Shi-ts? Do they suggest that expression of constitutively active Rab11 is equivalent to the inhibition of vesicular trafficking? If so, what would be the effect of Rab11 RNAi? Would it produce an opposite phenotype (less sleep)? Repo>Rab11 DN could be useful, but it was lethal. The authors should try using tub-gal80ts, to achieve inducible expression of Rab11 DN. Also, does Repo>Rab11CA cause resistance to mechanical sleep deprivation, just like Shi-ts? 11) One of the major claims of this paper is that inhibition of endocytosis in glia (Shi-ts, Rab11CA) increases sleep. It is important to show that an opposite manipulation of increasing endocytosis actually reduces sleep. The data shown in Figure 4C is confusing and seems to contradict the data in Figure 4D. In Figure 4D, Repo>Rab11CA causes increased sleep, compared to parental controls. The interpretation is that this happens due to inhibition of endocytosis. However, in Figure 4C, using RepoGS driver, Rab11 DN induces even more sleep than Rab11CA. It seems that both of these opposing manipulations cause increased sleep, which is counter-intuitive. Could it be that both manipulations simply make glial cells sick, and therefore, in both cases, sleep is increased due to malfunction of glia, and not due to specific changes in endocytosis? The possibility for a non-specific effect is supported by similar data in Figure 4—figure supplement 1C, where expression of either DN or CA versions of Rab27 and Rab30 produces exactly the same phenotype of increased sleep. 12) In Figure 4—figure supplement 1B – are the effects of Rab3, Rab9 and Rab11 that were significant in Figure 4A (without RU486) still significant in the Figure 4—figure supplement 1B (with RU486)? The significance stars in Figure 4—figure supplement 1B are shown only for Rab1, Rab5, Rab27 and Rab30. 13) How do the authors explain the phenotypes caused by the expression of other Rabs, besides Rab11? Do they think that they all work by affecting endocytosis? 14) In Figure 5, the authors should demonstrate that their genetic manipulations (Shi-ts and Rab11CA) actually can inhibit endocytosis in the surface glia using the 10kd dextran absorption assay. Also, could it be that the changes they see after SD are in fact caused by physical damage to the BBB? They may test if the effects of SD on endocytosis are resolved once the flies are allowed few hours of recovery after SD. They can also test how thermo-genetic SD affects their assay. They should also do EM on BBB after SD. 15) There is an apparent contradiction between Figure 1, Figure 2, Figure 3Figure 4 and Figure 5. According to Figure 5, SD causes increased endocytosis. SD of course increases sleep pressure. But, in the Figure 1, Figure 2, Figure 3 and Figure 4Figures, the authors claim that inhibiting endocytosis actually increases sleep, suggesting that endocytosis in BBB promotes wakefulness. A possible solution to this paradox is that during normal sleep, there is an increase in endocytosis. This is important to support the function of sleep because increased endocytosis eventually helps to reduce sleep pressure. This is why inhibition of endocytosis promotes sleep – because in the absence of proper endocytosis, sleep quality is compromised, and sleep is then less effective in reducing the sleep pressure. 16) Are the changes in endocytosis that correlate with sleep state specific only to surface glia? The authors should have additional control in Figure 5 – test if there are any changes in endocytosis in other populations of glial cells, as function of sleep. This paper explores the functional contributions of the blood brain barrier (BBB) to sleep regulation in the model system Drosophila. It is a careful study that uses a full range of genetic cellular and imaging methods to consider the hypothesis that endocytosis/exocytosis in BBB glia changes in ways that supports the role of these cells in helping resolve levels of metabolites that increase in relation to sleep-need. Further it makes a strong case for the involvement of Rab11 in the cellular mechanism. The emerging involvement of glial compartments in the fundamentals of brain physiology (here sleep regulation) makes this work a significant contribution of interest to a general audience. The work is clearly described, thorough in most aspects of the analysis and discussed in a scholarly fashion. I have a few questions and concerns that may help improve the paper. Shibere mis-expression and effects on sleep. The paper wisely pays careful attention to the effects (and lack of effects) of temperature with a classic ts allele of dynamin. In addition, I also commend the use of different shi isoforms to help focus on the biologically (not technically) important results. I had one question about this dataset that involved, not amount of sleep, but its temporal patterning. The results suggest that sleep during SD happens at both temperatures but I notice that nighttime sleep is elevated sooner in both males and females at 18 degrees, than in controls. Is this impression correct? and if so, is there an explanation? This difference (if reproducible) involves latencies and time of day differences. In my reading of the fly sleep literature, there is an increasing fragmentation of cellular mechanisms between those that affect daytime versus nighttime sleep. Is there any basis to think or expect that the cell biological mechanisms (exo- and endocytosis) should be geared to daytime versus nighttime? The ultrastructural work is an effective supporting body of evidence to evaluate the effects of UAS-shi at permissive temperatures. However, the results – amassed ring-like structures resembling microtubules, and a thinner PG layer – were not well-described, beyond the positioning of two arrows in one of the micrographs. There was no clear definition of the phenotypes nor any indication of prevalence, severity or quantification (either within or between animals). Were the suspected MTs coated or bridged as originally described in the paper cited? There no details provided in the methods regarding gender, time of day, age, or "n" value. On a tangential (but relevant) note, was ultrastructure observed at only a single phase point? This issue is clearly beyond the scope of the current study. 3A – which UAS-shi was used? - Male or female flies? - The effect does not appear to match that of repo-Gal4. Difference is no more than 100 m; whereas. In Figure 2A, the difference is >200 min. Is this lack of quantitative matching significant? Maybe it reflects the strength of the Gal4s but alternatively it could mean that other cells contribute. I did not find any discussion of this point. The screens were careful, unbiased, quantitative and very large in scope. I commend the authors for determining that the Gs-Gal4 line was leaky but was somewhat confused by the overall definitions of hits. There was a set of hits with no RU486 (Rab 3, 5 and 9) and a different one with RU486 (Rab1, 5, 27 and 30). Yet at the end, only Rab11 is judged to have experimental support – I was not clear why (1) only Rab11 and not others crossed threshold. Also (2) whether Rab11 is a positive or negative regulator of sleep. 2) Paradoxically, Rab11 activity appears to increase sleep in the follow-up but in the preliminary large scale screen the DN isoforms of Rab11 produced significantly more sleep than did the CA isoforms – by my reading that means Rab11 in glia is a negative regulator. So, I'm not sure how to interpret the combined dataset. 1) Why dissociate cells before adding Alexa647-dextran? Why not measure before dissociation? The results are fortunately very clear, but I would think cellular processes like endocytosis would be more robust in an intact brain. 2) Also it would be a stronger case if a different amount of SD produces a proportionate change in endocytosis (i.e., two points on the concentration-effect curve). Also, would it would strengthen the case to measure endocytosis following more sleep (to control for potential contribution of stress to change); This would require orthogonal genetics to drive sleep-inducing FB neurons, so I suspect the genetics would be too complicated for a two-month period of additional study. We have expanded the nighttime time points and included these findings in (Figure 5B). We also show time points around the clock (Figure 5—figure supplement 2B). To examine whether adult-induced expression of Shi produces irreversible alterations in sleep, which could signify permanent changes in function of the barrier, we expressed Shi in glia under the control of tubGal80.ts. In these experiments, temperature-dependent expression of tubGal80.ts suppresses Shi expression during development but allows expression in adults. We find that sleep is increased upon adult expression of Shibire and returns to levels which are not significantly different from controls when expression is blocked (in each case with a temperature shift) (Figure 3—figure supplement 1B). Although this is a good point and we would certainly like to resolve this question, there are a number of scientific and technical difficulties that prevent us from doing so. First, more or less deprivation does not necessarily correlate with a linearly proportionate response, whether in behavioral rebound or cellular measures (for instance, 12 hours of deprivation does not necessarily produce a larger rebound than 6 hours). Second, due to the degree of variability in the endocytosis assay, we do not have the resolution to detect such a difference. If we expand our time points after a period of deprivation, we still may not be positioned to detect a difference. We have examined later night time points (Figure 5B) and found that while endocytosis is high during early night sleep and low by the end of the night/early day, it is difficult to determine a difference in the time points in between, meaning that endocytosis may be largely complete within the early hours of sleep or we simply do not have the resolution with this technique. To examine potential bidirectionality and assess the contribution of stress, we have elected to use Gaboxadol to induce sleep rather than introducing the added complications of orthogonal genetics and the requisite temperature-induction. We found that enhancing sleep throughout the day did not decrease endocytosis at ZT14, but endocytosis was increased at ZT2 if flies were treated with Gaboxadol prior to this point (Figure 5C). We suggest that Gaboxadol increases sleep pressure and so promotes endocytosis at all times, thereby accounting for lack of a decrease at ZT14. Importantly, these data indicate that it is not the stress of sleep deprivation which is responsible for elevating endocytosis, as two methods of inducing sleep at a time when wake predominates both increase endocytosis. In addition to the discussion of sub-points below, we have added a few remarks throughout the text clarifying why the given Gal4 lines were used for particular experiments. The Gal4 lines used in this study, other than Rab9-G4, have all been previously described and used for glial expression. We have emphasized this point and ensured that appropriate references for all drivers are included in the text. The Gal4 lines we used (Figure 3—figure supplement 2) have limited expression, if any, outside the BBB; given that, it would be difficult to co-localize expression with a pan-neuronal or pan-glial stain. In lieu of a counter-stain, we have provided Gal4>GFP expression in the presence and absence of repo-Gal80, which by comparison makes clear what expression is neuronal and what glial (Figure 3—figure supplement 2B). This is particularly evident for the drivers relevant for behavioral differences, such as Rab9-Gal4, as the surface glia are easily distinguishable from all other cell types. As requested by the reviewer, we provide an outline of the brain in Figure 3—figure supplement 2A. The SPG glial cells are implicated by two drivers, Rab9-Gal4 and Moody-Gal4. To confirm the adult-specific effect of Shi, we now provide the tubGal80.ts experiment with a second driver, Repo-Gal4 (Figure 3—figure supplement 1). The data confirm that conditional adult expression is sufficient for the glial sleep phenotype. To rule out the possibility that a sensory defect in Repo>Shi flies makes them unresponsive to the mechanical stimulation of sleep deprivation, we stimulated the experimental and control flies at ZT11 – 12, a time when flies are predominantly awake, as suggested. We find no difference in the resultant beam crossings induced by stimulation between Repo>Shi flies and controls (Figure 1—figure supplement 1), suggesting that resistance to sleep deprivation cannot be accounted for by impaired sensitivity to the stimulus. Also, we are not aware of sensory structure expression of PG and SPG. While we agree that a minimally perturbed sample might better reflect cellular processes occurring in vivo, in our hands we have found that dissociation is necessary to allow access of AF647-Dextran to both sides of the barrier. Even with a smaller (3KD) dextran we did not observe any appreciable penetration into an intact brain (Figure 5—figure supplement 3). We have added this experiment (Figure 4—figure supplement 2). Resistance to mechanical stimulation appears to be specific to Shi, with surface glial being sufficient. It is plausible that Shi provides a more general perturbation of trafficking than Rab11, hence capturing both baseline and resistance phenotypes. These data also demonstrate that these effects can be separated as Rab11 only affects baseline sleep. We are not sure that this difference in latencies that the reviewer mentions is a consistent finding in our data. The difference in latency between 18 and 30 degrees could also be a consequence of the shift in sleep patterns related to temperature, as touched on elsewhere in the text. With respect to time-of-day differences, it is true that some publications demonstrate effects predominantly on daytime or nighttime sleep when given neuronal populations are manipulated, but in our view, there is not yet a clear delineation between circuits and mechanisms which govern daytime vs. nighttime sleep. Likewise, there is little evidence to suggest that daytime sleep and nighttime sleep serve different functions in the fly. The figure has been updated to include daytime sleep. The result is still the same – Shi-wt is not significantly different from both controls, in terms of total or day sleep. Daytime and total sleep figures have now been included, either in the main text or supplements in order to not crowd the figures. We showed that the increased sleep phenotype is present with Repo-G4 (only glial expression) as well as Rab9-G4 (BBB expression), but not when glial expression of Rab9-Gal4 is blocked. Comparing expression of surface glial drivers (moody, Rab9, NP6293) in the presence and absence of repo-Gal80 (Figure 3—figure supplement 2B) shows little or, in the case of moody-G4, no expression in neurons, therefore making it quite unlikely that the phenotype is due to non-glial expression. We conducted additional experiments to address this question and find that the resistance to sleep deprivation phenotype indeed tracks to surface glia, with NP6293 G4 being sufficient (Figure 3—figure supplement 3). In the screen of glial sub-type drivers, we chose to use the individual surface glial drivers instead of 9-137 G4 in order to establish the effects of each population in isolation, just as the other glial drivers were chosen for specificity to individual glial sub-types. Nevertheless, Shi expression with 9-137 G4 also produces an increase in sleep, albeit smaller than would be expected if combining the effects of the surface glial lines individually (and smaller than that produced by repo-Gal4). This may be a consequence of differences in driver strength, which are not readily assessable or comparable. Given that NP6293 G4 and moody G4 are on the same chromosome, the effort required to perform these experiments may not be worth the potential result because there still may be a discrepancy in driver strength between the surface glial drivers and repo. A line has been added regarding this point. As the reviewers point out, it may very well be a difference in driver strength, and/or that repo-G4 encompasses both surface glial populations while the lines in Figure 3A do not. We do not believe so as the UAS control does not achieve ceiling levels of sleep, so there is still room for an increase. Also, as sleep varies some from experiment to experiment, we are careful to always compare to controls within the same experiment. Importantly, a different astrocyte driver also does not increase sleep significantly above the controls. As these data used the other Shibire line, rather than the 20xShibire used in much of the manuscript and in the rest of Figure 3A, we did not include them in the manuscript, but provide them for the reviewer (Author response image 1). Shibire expression in astrocyte-like glia does not increase sleep. Total and daytime sleep of Eaat1-GAL4>UAS-Shi.ts1;UAS-Shi.ts1 female flies at 18°C (n=16, each genotype). One-way ANOVA with Holm-Sidak post-hoc test, * P < 0.05, ** P < 0.01, *** P < 0.001. Error bars represent standard error of the mean (SEM). The details requested regarding the animals used have now been provided in the methods and/or figure caption. Briefly, our intention is to highlight the presence of unusual MT and intracellular structure in glial cells expressing Shi at 18 degrees. This simply demonstrates that by EM, expression of Shi at permissive temperature is not without consequence in glia, as has also been shown for neurons in the paper cited. While perhaps we could quantify something like the number of MTs over a length of surface glial area, it is not clear that this or any other quantification will be a useful measurement, because the phenotype is binary – the structures are present in Repo>Shi tissue, and not found in controls. In addition, it would be useful to know if these are also seen following induction of wild-type dynamin, because WT-dynamin expression does not cause sleep phenotypes and there is the potential to examine how relevant these ultrastructural defects might be to the sleep effects observed. (Perhaps the cited EM paper has addressed this issue in neurons?) Are there any changes in membranes or vesicular structures that could potentially be connected to a block in endocytosis? What is the predicted EM phenotype associated with Rab11CA expression? Our hope was to identify membrane or vesicular structures in the control surface glial images to have a target for comparison with the experimental images. Unfortunately, perhaps due to resolution or preparation, we were unable to pinpoint obvious endocytic or vesicular trafficking events in the control images, thereby making it hard to compare to Shi flies and to say, beyond the gross changes described, where the alteration connected to blocking endocytosis is expressed. Determining whether WT-dynamin causes ultrastructural defects could be interesting, but even if so, we could not exclude a contribution of such defects to the sleep phenotype produced by Shibire as these defects may be necessary but not sufficient. Yes, the barrier does not appear permissive to dextran when Rab11CA is expressed (Figure 4—figure supplement 2). We agree that the ideal comparison would be between each manipulation and its respective parental controls. But since our initial purpose was to screen as many Rabs as possible (which included multiple CA and DN lines per Rab in most cases), we chose to compare CA and DN effects of the experimental animals only. As noted below, we expected that CA and DN would have opposing effects, although this is not always the case. We followed up Rabs that were promising in the initial screen by using Repo-G4 and including all of the parental controls. Rab11 was a positive in the DN/CA screen and, in subsequent assays, Rab11 CA consistently increased sleep relative to controls, regardless of whether it was expressed with Repo or BBB drivers. This is now clarified in the text. Rab11 can affect endocytosis, as knockdown of Rab11 has been shown to inhibit endocytosis and transcytosis, for example, of LDL (Woodruff et al., 2016). Assuming that CA and DN have opposing effects, Rab11CA would not be expected to block endocytosis; however, DN and CA versions can sometimes go in the same direction, with WT or CA mutants blocking the pathway at a specific point due to limiting amounts of binding partners. In addition, for the Rab collection we used, the Rab CA and DNs are called so based on the best prediction that the sites mutated will be GTPase-defective and GTP-binding defective, rather than functional confirmation of their CA and DN activity; in fact, Rab3 is mislocalized with CA and DN mutations (Zhang et al., 2007).In the case of Rab11, in particular, both the DN and CA mutations we used alter trafficking in one direction in certain contexts (Khvotchev et al., 2003). Therefore, it is possible that Rab11 CA inhibits endocytosis. Alternatively, if the mechanism underlying the sleep phenotype involves, for example, a certain receptor, it is also possible that Rab11 CA and Shi lead to the same behavioral phenotype by keeping the receptor on the plasma membrane – Rab11CA by promoting its recycling, and Shi by inhibiting its endocytosis. We have driven Rab27 and Rab30 with the surface glial drivers, but have not found consistent phenotypes when limiting expression to these glial populations. Thus, Rab11 is specific in terms of increasing sleep through this population, as sleep-promoting effects of other Rabs likely map to other glia. The similarity of increased sleep may therefore suggest sleep functions of Rabs in other glial populations. Concerning the discrepancy between RepoG4 and RepoGS sleep effects of Rab11CA and DN, it is difficult to compare as Rab11 DN is lethal with constitutively expressed Gal4s, while CA is not. As we have stated above, it is possible that CA and DN mutations do not really have opposing effects at the cellular level. In this case one might argue that CA is simply a weaker blocking mutation than DN. Nevertheless, Repo>Rab11CA flies do not appear to be sick and show intact general integrity of the BBB (Figure 4—figure supplement 2). 18) In Figure 4—figure supplement 1B- are the effects of Rab3, Rab9 and Rab11 that were significant in Figure 4A (without RU486) still significant in the Figure 4—figure supplement 1B (with RU486)? The significance stars in Figure 4—figure supplement 1B are shown only for Rab1, Rab5, Rab27 and Rab30. Our standard for selection, as further clarified in the manuscript, is that all available DNs be significantly different from all available CAs. By this measure Rab3, 9 and 11 are different in the no-RU condition, and 1, 5, 27 and 30 are such in the RU condition, hence the difference in stars. Nevertheless, if we look at individual comparisons for the aforementioned Rabs in the RU+ condition, we find that the lone DN line of Rab3 is significantly different from one (of two) CA lines, a single DN line for Rab9 is significantly different from both CAs, and a single DN line for Rab11 is significantly different from both CAs. To address this point we have built upon a relevant line in the Discussion section. In short, we propose that endocytosis in the BBB is a function of sleep and serves a homeostatic need. As shown in Figure 5, endocytosis is enhanced during times of baseline sleep, or during rebound sleep induced by sleep deprivation. If endocytosis during sleep fulfills a homeostatic role, it would follow that endocytosis would decline as sleep continues (see Figure 5B), just as sleep pressure does. In the experiments where we inhibit endocytosis at the surface glia, we believe we have created a situation where the potential homeostatic function of endocytosis cannot be accomplished, hence these flies may not be able to dissipate sleep pressure, and therefore have perpetually increased sleep. Our interest in endocytosis in the surface glia stems from our findings that Shi expression in these populations produces changes in sleep behavior. This does not exclude the possibility of sleep-dependent changes in endocytosis in other glial populations (or even neuronal populations). For example, phagocytic engulfment may be altered in astrocytes by sleep deprivation (Bellisi et al., 2017). We thank Zhifeng Yue and Kiet Luu for technical support and members of the Sehgal lab for discussion and reagents. We would like to also thank the Gerald Rubin, Konrad Zinsmaier, Marc Freeman, and Roland Bainton labs for sharing reagents, and the Electron Microscopy Resource Laboratory at Penn and the Children’s Hospital of Pennsylvania Metabolomic Core. © 2018, Artiushin et al.